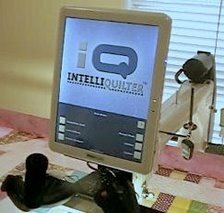 IntelliQuilter Training Videos: Re-starting a pantograph after shutting down iQ. Here I'm showing how to re-start a panto after shutting down. The key is to answer yes to the question,"Do you want to save the needle position?" when you shut down. This is so helpful for any type of quilting, edge to edge or custom, when you need to find where you were before you shut down. If you have to shut down mid-way through a row, save the needle position where you stopped and you'll see that place when you start up the next day. The target will be exactly where you stopped so you can do the initial alignment to that place. When you get to the sew quilt page, iQ will go right to that place to start stitching. In the video my machine moved to the right instead of to the left for the start of row 3 because it was moving to the saved position of the needle, which was at the end of row 2. I had set up all the rows of this pantograph with stop to cut threads as the transition so iQ wanted to get back to the saved needle position so I could cut the threads. Ofcourse, I didn't need to do that. Zoltan has an excellent suggestion to help with this process. Before shutting down, place a piece of masking tape or something similar on the quilt under the needle then drop the needle to make a hole in the tape. Answer yes to the do you want to save your needle position question with the needle over the hole in the tape. Do not advance the quilt so the next day when you start up, you can align the saved needle position, which is the red target on the screen, with the hole in the tape.